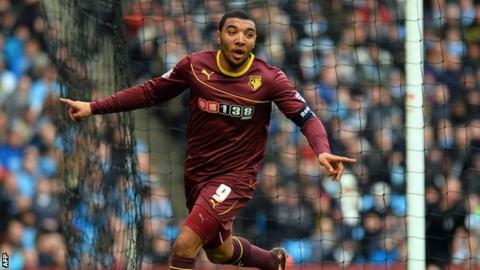 Watford striker Troy Deeney says inflated prices for British players are reducing chances in the Premier League. The 26-year-old has ended speculation he was set to leave for a top-flight side by signing a new four-year deal. "I saw [Newcastle United boss] Alan Pardew say he won't buy British players because they're too expensive," Deeney told BBC Three Counties Radio. "That's one club you're already out of, plus the top six sides. So you've only got 13 teams left to choose from." There have been numerous examples of premium prices paid for British players this summer, with Ross McCormack (£11m), Adam Lallana (£25m), Calum Chambers (£16m), Luke Shaw (£30m) and Robert Snodgrass (£6m) all making big money moves. Pardew had bemoaned the cost of British strikers after failing to bring in Blackburn's Jordan Rhodes, although the Magpies boss has signed Jack Colback, Jamaal Lascelles and Karl Darlow this summer. "I had speculation the season before and it kind of messed with my head a bit. This year I haven't been worried. My mum tells me all the details. She has Watford fans saying 'is he going here or there?' I tell her to chill out and it will be sorted." "It's going to be harder to get into the Premier League the longer it goes on," said Deeney, who has 45 goals from the last two seasons. "It does make me laugh that people can be worth £10m. It's mad. "When players are made available you have to pay the £20m and £30m that people are asking for." Deeney's new contract essentially extends his Watford contract by a year, as he had two years and a 12-month option remaining on his previous deal. He said the new terms would keep him at the club for "a year minimum" and that the prospect of winning promotion with the Hornets was more appealing than not getting regular football with a Premier League side. He said: "It was a case of do I want to move now and possibly sit on the bench somewhere? "I think this is the best move. "If I score 20 goals as captain and we go up, I'm going to be quite well known around these parts for a little while."